Ullekh N.P. in his book, The Untold Vajpayee: Politician and Paradox, writes how RSS backed a reluctant Advani for leader of opposition in Lok Sabha instead of Vajpayee. Vajpayee contested the 1991 Lok Sabha election despite being a member of the Rajya Sabha—he had done so earlier in 1967. He contested from Lucknow, a constituency he would continue to represent till 2009. Being the senior-most leader of the main opposition party, it was a ‘foregone conclusion’, according to senior leaders of the time, that he would be named the leader of the Opposition in the Lok Sabha. He had been the leader of the legislature party of the Jana Sangh and later the BJP. But much to his surprise and others in the party, the RSS backed a reluctant Advani for the post. Again, Vajpayee couldn’t have been accommodated as the BJP chief because Murli Manohar Joshi had become president only recently. Govindacharya, who was a key BJP organization man at that time, noticed that Vajpayee felt slighted because he believed that he should have been made the leader of the Opposition in the Lok Sabha. But columnists such as Swapan Dasgupta shared the viewpoint of a section of the RSS leaders: that until Advani transformed the BJP into a mass movement through rath yatra, the BJP was a party of ‘some well-meaning notables who, while individually respected, were deemed to be politically inconsequential’. Which was why the RSS was hell-bent on rewarding Advani even at the cost of antagonizing Vajpayee. Since 1968, after the death of Deendayal Upadhyaya, Vajpayee had been the No. 1 in the Jana Sangh and later the BJP. And it wasn’t easy for him to come to terms with being pipped to the topmost position in his party. However, Advani, who had been deputed by the RSS in 1957 to assist Vajpayee in parliamentary work, maintained cordial ties with his one-time mentor. Often when the two had differences of opinion, either Vajpayee invited Advani and his wife Kamla to his home or called up Kamla and invited himself over to Advani’s home to settle matters. Equally ambitious, both claimed that they were good friends despite differences of opinion over several issues. The BJP leaders who were close to both at the time, however, say that there were many months the two didn’t speak to each other except for perfunctory greetings inside the House. 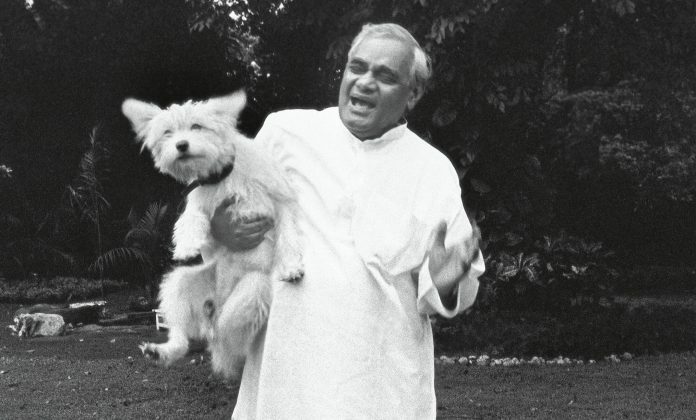 Though he was miffed, Vajpayee was at the same time glad that the party had grown from a smaller entity to a national party with increasing presence in new turfs, including the south of the Vindhyas. He began to go regularly to the 11 Ashoka Road headquarters of the BJP although he was not happy with the way the RSS was trying to denigrate him. At a national executive meeting of the BJP in Ahmedabad in 1992, his pent-up emotions were on full display when the ageing leader, midway through discussions, attacked Govindacharya for playing the ‘Chanakya’ and pulling strings from behind to decide who landed coveted party posts. Before Govindacharya could counter Vajpayee, Advani interrupted and, in an attempt to defuse the situation, declared that the discussions were over. Excerpted with permission from Penguin Random House. ” which was in many ways narrow-minded and rigid.” ..the writer’s prejudices on display here? It is not time for spreading venom.Shekhar Gupta working with a vengeance on MODI.Atal Bihari Vajpayee is the greatest leader who worked for nation honestly without being corrupted by power.His life is saintly.His preferences are well being of mass.Whereas all other Congress leaders are full of treason corruption nepotism. There can be no comparison, equivalence, parity between the two men. One’s silences and pauses were more eloquent than the other’s Sanskritised Hindi – yuha and waha -, his wringing of hands, more recently his frequent breaking into tears could possibly be. His rath yatra generated political capital, true, but it left a terrible trail of widows and orphans in its wake. While comparisons between Nehruji and Vajpayeeji are entirely justified, they now belong to the same historical pantheon of great Indian Prime Ministers, it would be a travesty to equate Shri L K Advani with Sardar Patel.